Linda and Paul Brown, your Cleveland Illini Presidents, are back and ready to kick-off a renewed focus on the Cleveland Illini Club. This club is about all of us as University of Illinois Alumni and our loyalty to the University. 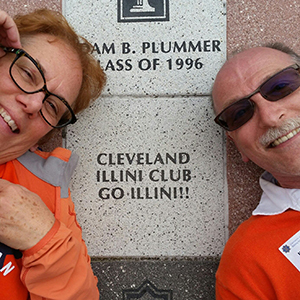 There are over 1,400 Orange and Blue Alumni in northeast Ohio and we share a common bond of Illini pride. We are excited about creating opportunities to connect with our fellow alumni, to make new friends, to network for mutual benefit, and to show our presence in Ohio. We want to develop a full schedule of events for the upcoming year, and we want you involved! We are scheduling Illini Alumni Drop-in Happy Hours in multiple locations over the next few months to meet you and hear your ideas. And, we will be scheduling Football and Basketball Game watches this fall and winter. Please plan to show up. Bring your event ideas, Illini Spirit, and reconnect with fellow Illinois alumni. We look forward to seeing you! !